A total of 125 people killed in violence nationwide on Friday including 74 civilians, 29 soldiers and 22 rebels according to one report. 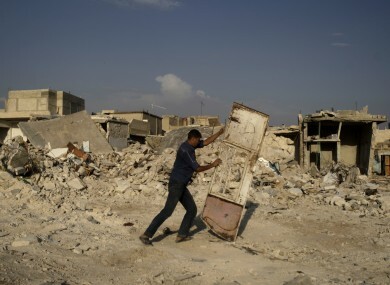 A Syrian man pushes a door away from the rubble of houses destroyed in a government airstrike, in the Syrian town of Azaz on Friday. SYRIAN REBELS LAUNCHED deadly attacks on the military earlier today in a campaign increasingly targeting its air power, as President Bashar al-Assad’s traditional ally Russia said it was “naive” to expect him not to fight back. Rebel fighters captured the main air defence building in Albu Kamal on the Iraqi border, the Syrian Observatory for Human Right said, adding that “preliminary reports” suggested they had seized ground-to-air missiles that could boost their ability to down government aircraft. The assault late last night came hot on the heels of a rebel attack on the Abu Zohur air base in Idlib province in the northwest, where the Free Syrian Army said it downed a MiG warplane shortly after takeoff earlier this week. With the insurgency intensifying, Russian Foreign Minister Sergei Lavrov said calls by Western and Arab governments for Assad to unilaterally pull back his troops amounted to a demand for “capitulation” that they had no right to make. In their assault in Albu Kamal, rebel fighters also captured 16 air defence personnel and attacked the nearby Hamdan air base, the Syrian Observatory said. The seizure of the air defence headquarters was a “major coup” for the rebels, the Britain-based watchdog’s director Rami Abdel Rahman told AFP, adding that it sparked retaliatory shelling in the town of some 60,000 people that killed at least five civilians. They were among a total of 125 people killed in violence nationwide on Friday — 74 civilians, 29 soldiers and 22 rebels, according to the Observatory’s figures. The rebels claim to have destroyed a dozen aircraft on the ground in their attacks on air bases in recent days as they seek to counter the government’s use of MiG warplanes and helicopter gunships against them. In Idlib province, a major battleground on the Turkish border, rebels attacked an army roadblock in the Harem district early today, killing or wounding nine soldiers, the Observatory said. In the central province of Hama, rebels killed at least four soldiers in a similar attack, it added. In talks with Syrian Prime Minister Wael al-Halaqi in Tehran on Friday, UN chief Ban Ki-moon said that Assad’s regime must stop using its heavy weapons. But the Russia’s top diplomat said on Saturday that such calls were “completely unrealistic”. “When our partners say that the government must stop first and withdraw all its soldiers and weapons from cities — and only then call on the opposition to do the same — well, this is a completely unworkable scheme,” said Lavrov. ”Either people are naive or it is some sort of provocation,” he added. Both Damascus and Aleppo – Syria’s two largest cities — have seen persistent fighting between troops and rebels in a conflict that has now claimed more than 26,000 lives since March last year, according to the Observatory’s figures. The International Committee of the Red Cross has warned that the situation across large swathes of Syria is “edging towards irreversible deterioration”. Email “Syria: Rebels target government aircraft after seizing air defence building ”. Feedback on “Syria: Rebels target government aircraft after seizing air defence building ”.